Earn $1.49 in Rewards credit. Click to learn more. 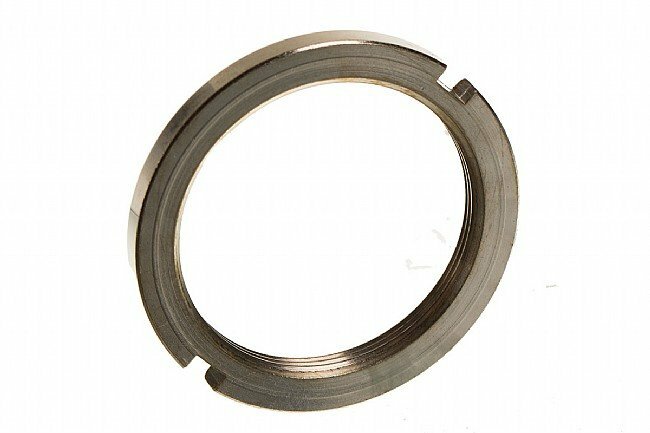 Use this Mavic French Track Lock Ring for Mavic Ellipse track wheelsets which use a French 1.37" x 24 TPI threading instead of the standard 1.29" x 24 TPI threading. Description is wrong. Product is fine. It is a myth that the modern Mavic Ellipse wheel set has French threads which are in truth, extinct, production-wise. Those are English threads with a slight proprietary tolerance making the hub dislike other English rings such as Dura-Ace. Call it bad English. Now, true French track hub threads still may be found on the Mavic 520 Piste hub produced in the 80's and even more rarely, on some Campagnolo hubs designated Francaise. The French lockring threads were 33x1 metric with the stepped-up cog thread at either (French) 34.7x1 or English 1.37x24. French threads are close enough to Italian for somebody to make that mistake (once) but neither an English ring or cog will not even start on a true French hub. I have personally paid to have French lock rings custom-fabricated at much greater cost than the $13.49 charged for this thing. Trust me, French threads are something else altogether. Likely, somebody younger than 50 just assumed the Ellipse to be French because it's typical Mavic-weird. Weird yes, French NO. Good wheels make you ride faster.